I've been working on this sculptural piece for weeks. It turned out as very well, as perfectly as my vision for it had been. (This doesn't always happen!) 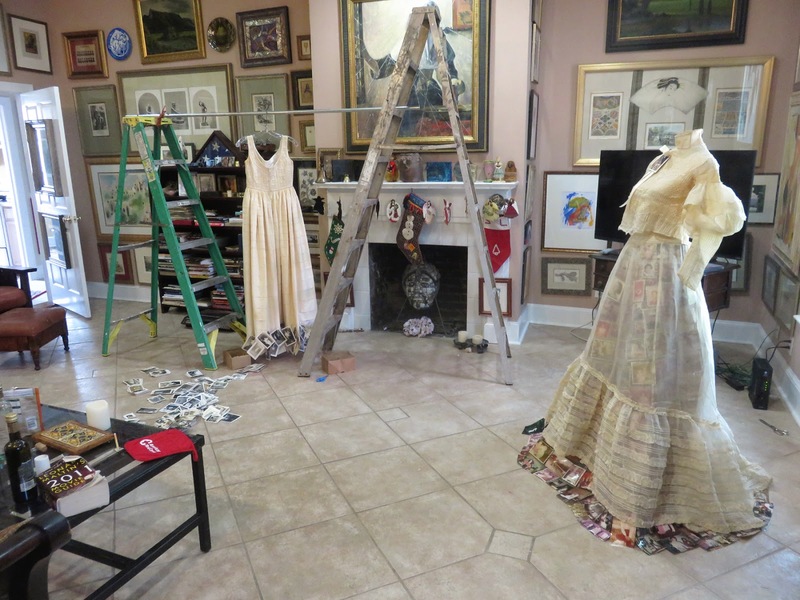 There will be two other "sculptural garments". I'm already working on the second piece. All three will be featured in my September solo show at the University of South Carolina's-Beaufort campus. The show is called Anonymous Ancestors. Everything in the exhibit includes anonymous vintage photos. 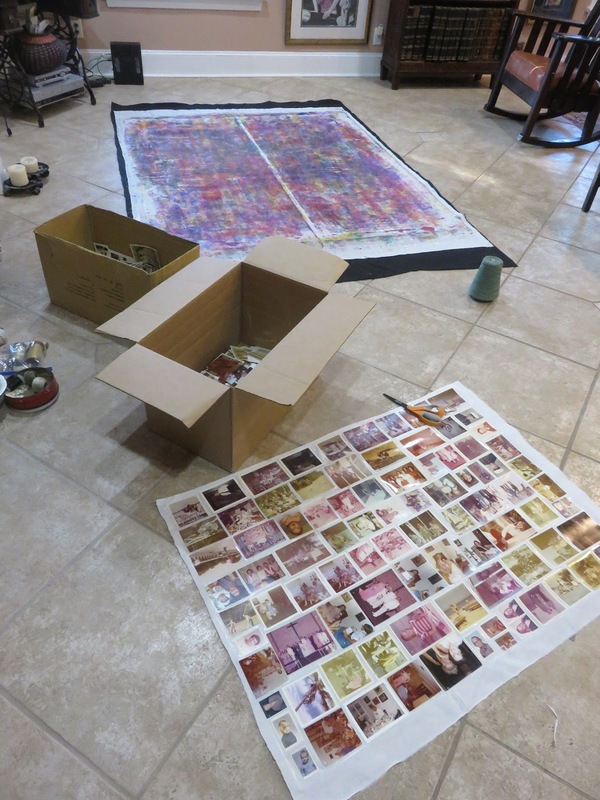 The exhibit will take the form of an installation. What do I mean by that? Well, an installation is a temporary, site-specific arrangement that intentionally transforms the space. Obviously, the show is "temporary". It will only be on view from September 2 through October 1. It is being developed to fill the provided gallery. So ... how will it "transform the space"? That will be achieved by turning the interior space into a nostalgic parlor, complete with a Victorian rocker, an altered chair, a marble-topped end table, a round glass topped table, and an Oriental carpet. 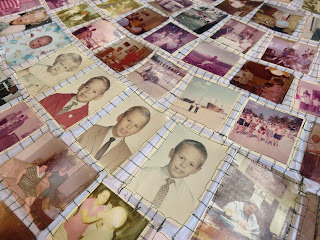 The tables will function as if pedestals for the altered photo albums. All in all, the interior space will create the environment for viewing the wall mounted art, transforming an ordinary, white-walled art gallery into a place for contemplation on one's own family photos and ancestral memories. Yet, it is important to me that this special place feel inhabited. Thus, the sculptural garments will lend a personal touch ... the suggestion of "people" ... perhaps long gone, perhaps yet to come ... but nevertheless, the universal sense of ancestors. 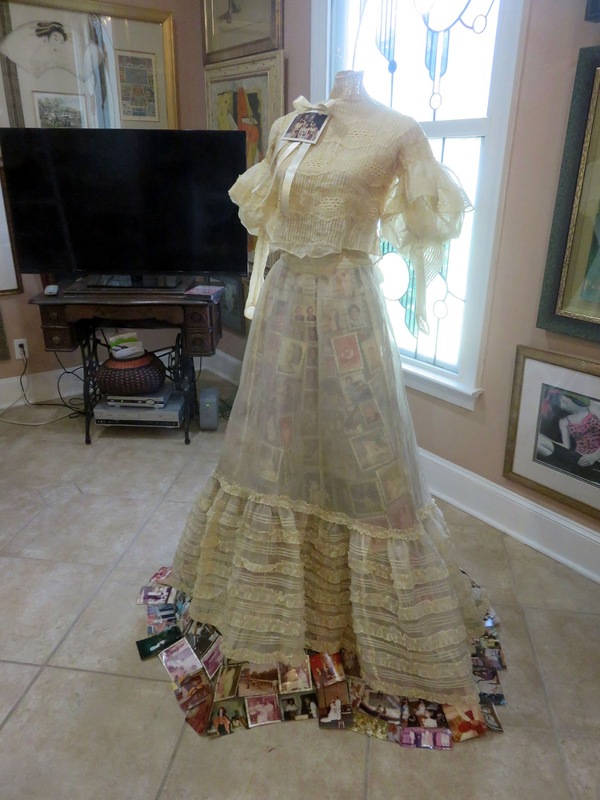 The vintage garment was donated to me by a friend-of-a-friend. Originally, it must have been for a very, very tiny woman. The lace top is extremely small. It was the two-part skirt, however, that inspired me. There are TWO skirts ... an under skirt with a wide, gathered hemline ... and an outer skirt with a wide gathered hem featuring tiny pleats and rows of ruffles. The material for both is rather sheer. I'm guessing that the sheerness accounted for the need to have two layers. For me, the two sheer layers immediately looked like a layer of photos could be inserted. 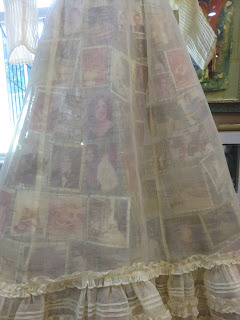 The underskirt would help support the photos. 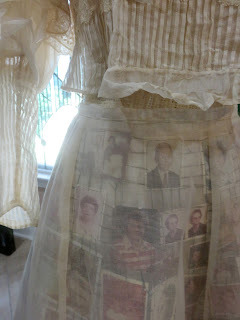 The outer skirt would provide a sense of fading memory ... the sense that all these people's names are being forgotten. It took hours to iron the two skirts. It took a day to stitch the grid of photos. 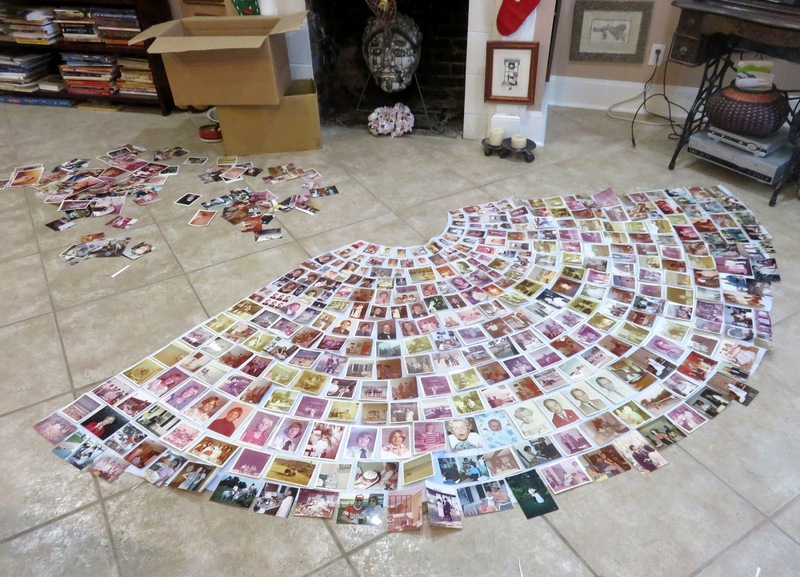 It took three days to mount all the photos on fabric and cut them out. 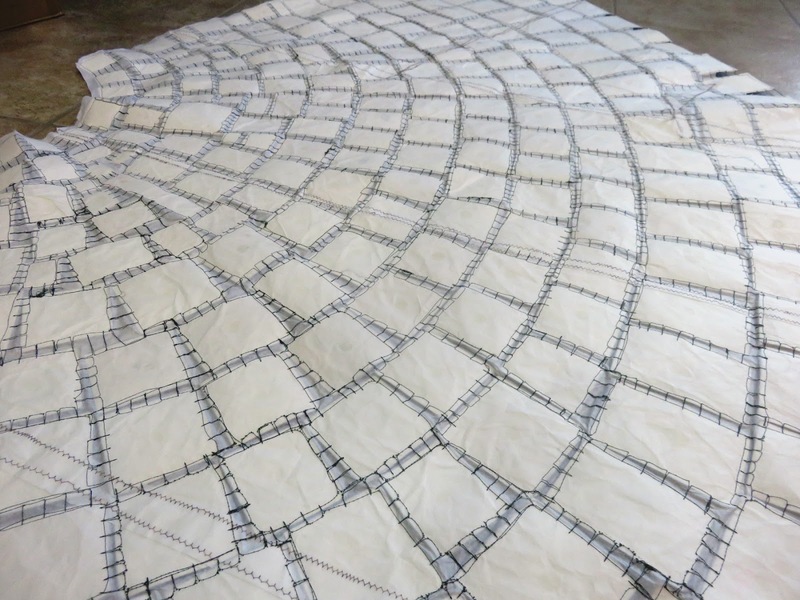 It took over a week to remove the stitch-and-tear paper on which the grid was created. Scroll down ... I have photos from this laborious (but worthwhile!) project. I got the small torso mannequin from Bill Mishoe's auction. 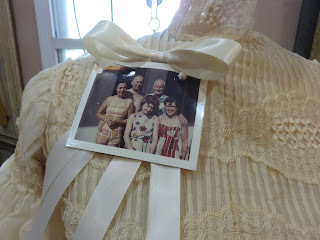 I don't think my vintage dress form can be manipulated to be as small as needed for the little blouse. 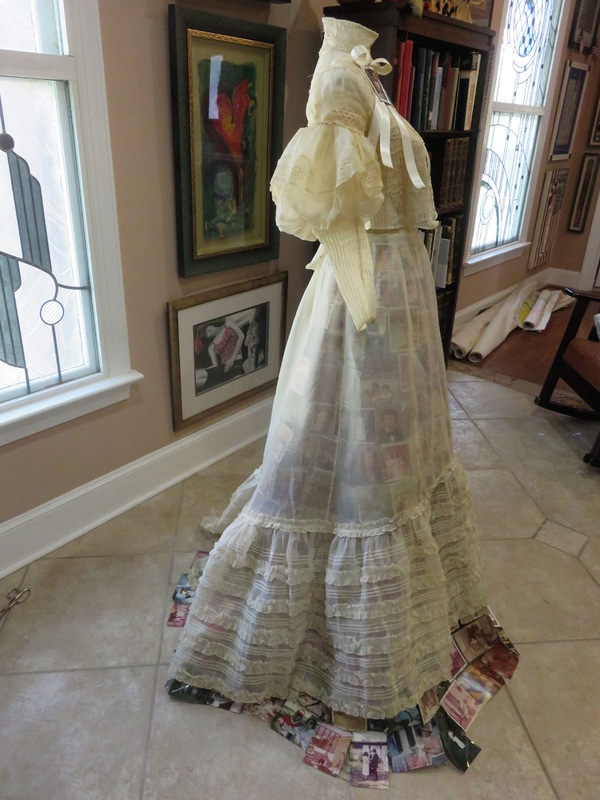 With a couple blocks of wood, I permanently rigged the mannequin to be tall enough for the skirt-of-photos to spill out from under the ruffled hem. Once in the gallery, I will probably pin some of the photos to the Oriental carpet. This will allow the skirt to be more fully rounded. 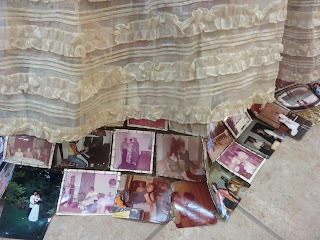 The skirt-of-photos was created using the same techniques as my Gird of Photos (which will be on display during the exhibit). 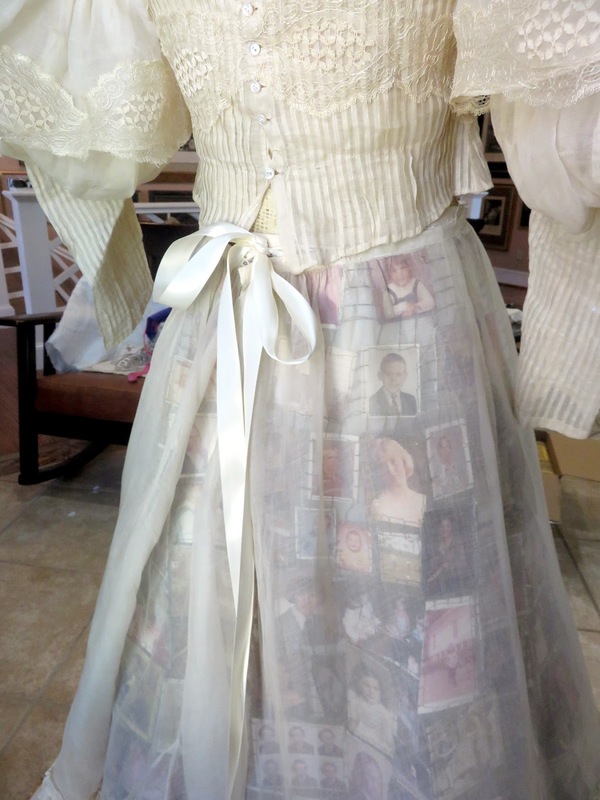 I stitched an off-white ribbon to the photos at the ends of the waistline. This allowed me to tie a bow, attaching the skirt to the waist ... between the two layers of the vintage skirt. Below is how this skirt-of-photos was created. First, I divided all my anonymous photos into two categories: Black-and-white and colored. All were fused to fabric in my giant dry mount press. Once fused, all the photos had to be cut out ... and placed in the appropriate box ... black-and-white or colored. For this first sculptural garment, only the colored photos were used. For the second one, I'm working with just the black-and-white ones. Using the vintage garment's under-skirt as a rough pattern, I created the appropriate shape using Pellon's 806 Stitch-N-Tear stabilizer. 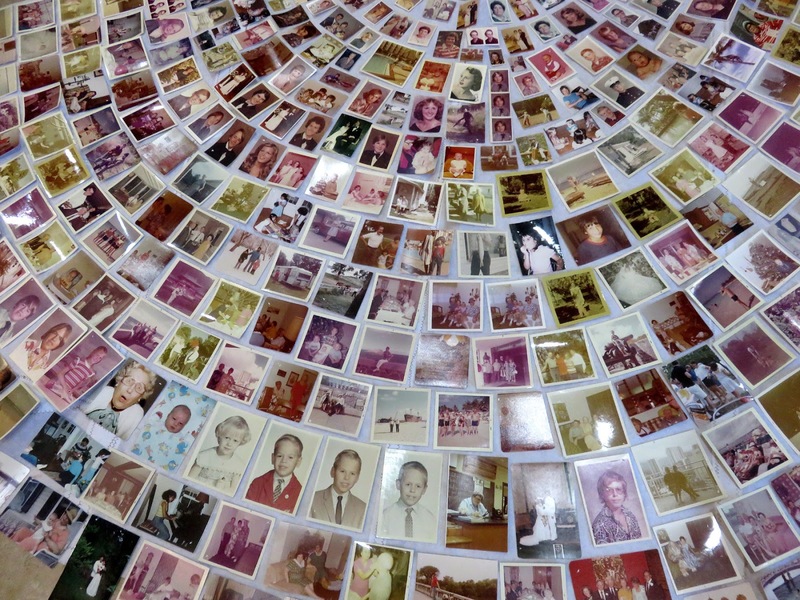 Photos were arranged on this paper pattern and adhered to it with a tiny drop of glue. 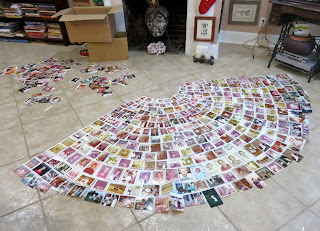 It was fun arranging all the photos. The glue was allowed to dry overnight. 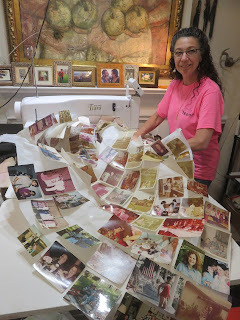 The next day I took the piece to my Tiara sewing machine ... linking all the photos together ... stitching them into a giant grid. Here's the resulting grid ... from the front. Here's the resulting grid from the back ... which is the side needing attention at this point. It took over a week to tear away all the paper ... from behind all the photos and between all the threads linking them. Steve helped! For over a week, neither of us could watch television without also tearing away the paper. Finally, it was finished ... and worth the effort. So now the living room looks like this. 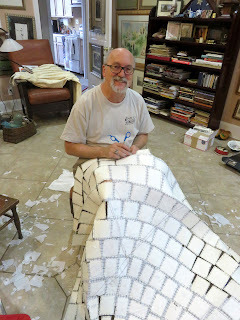 The second garment is now under construction. It's different process altogether but has the same potential to be another stellar addition to the upcoming exhibition! This. is. amazing! I love it. such a brilliant idea. I love how ideas develop...the gown had to be discovered in order to have the idea. Not sure how things work out on timing for when your gown is needed, but PLEASE enter it into SAQA Layered Voices if you can. It needs to be seen widely. 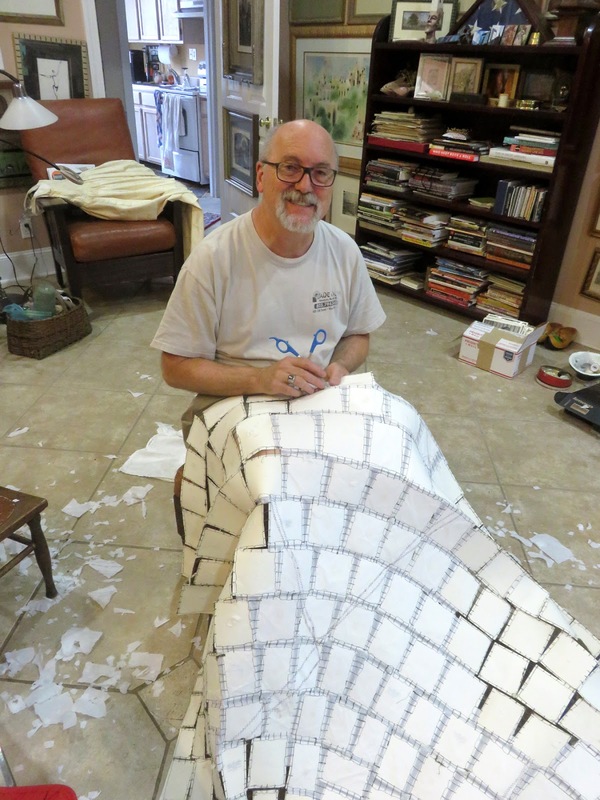 PS Can you think of an easier way to stitch w/out having to tear the paper? This is a fascinating idea with beautiful results. 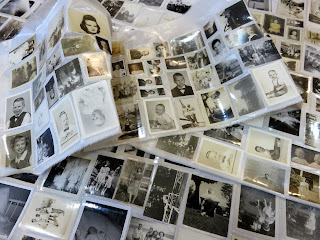 Were the photos you used originals or did you have copies made? Ahhhhh this is some fantastic work again Susan !!!!! !